When the responsible pathogenic microorganism is already known or has been identified, definitive therapy can be started. This will usually involve the use of a narrow-spectrum antibiotic. The choice of antibiotic given will also be based on its cost. Identification is critically important as it can reduce the cost and toxicity of the antibiotic therapy and also reduce the possibility of the emergence of antimicrobial resistance. To avoid surgery antibiotics may be given for non-complicated acute appendicitis. Effective treatment has been evidenced. Antibiotics may be given as a preventive measure (prophylactic) and this is usually limited to at-risk populations such as those with a weakened immune system (particularly in HIV cases to prevent pneumonia), those taking immunosuppressive drugs, cancer patients and those having surgery. Their use in surgical procedures is to help prevent infection of incisions made. They have an important role in dental antibiotic prophylaxis where their use may prevent bacteremia and consequent infective endocarditis. Antibiotics are also used to prevent infection in cases of neutropenia particularly cancer-related. There are different routes of administration for antibiotic treatment. Antibiotics are usually taken by mouth. In more severe cases, particularly deep-seated systemic infections, antibiotics can be given intravenously or by injection. Where the site of infection is easily accessed antibiotics may be given topically in the form of eye drops onto the conjunctiva for conjunctivitis or ear drops for ear infections and acute cases of swimmer's ear. Topical use is also one of the treatment options for some skin conditions including acne and cellulitis. Advantages of topical application include achieving high and sustained concentration of antibiotic at the site of infection; reducing the potential for systemic absorption and toxicity, and total volumes of antibiotic required are reduced, thereby also reducing the risk of antibiotic misuse. Topical antibiotics applied over certain types of surgical wounds have been reported to reduce the risk of surgical site infections. However, there are certain general causes for concern with topical administration of antibiotics. Some systemic absorption of the antibiotic may occur; the quantity of antibiotic applied is difficult to accurately dose, and there is also the possibility of local hypersensitivity reactions or contact dermatitis occurring. The majority of studies indicate antibiotics do interfere with birth control pills, such as clinical studies that suggest the failure rate of contraceptive pills caused by antibiotics is very low (about 1%). In cases where antibiotics have been suggested to affect the efficiency of birth control pills, such as for the broad-spectrum antibiotic rifampicin, these cases may be due to an increase in the activities of hepatic liver enzymes' causing increased breakdown of the pill's active ingredients. Effects on the intestinal flora, which might result in reduced absorption of estrogens in the colon, have also been suggested, but such suggestions have been inconclusive and controversial. Clinicians have recommended that extra contraceptive measures be applied during therapies using antibiotics that are suspected to interact with oral contraceptives. Interactions between alcohol and certain antibiotics may occur and may cause side-effects and decreased effectiveness of antibiotic therapy. While moderate alcohol consumption is unlikely to interfere with many common antibiotics, there are specific types of antibiotics with which alcohol consumption may cause serious side-effects. Therefore, potential risks of side-effects and effectiveness depend on the type of antibiotic administered. Antibiotics such as metronidazole, tinidazole, cephamandole, latamoxef, cefoperazone, cefmenoxime, and furazolidone, cause a disulfiram-like chemical reaction with alcohol by inhibiting its breakdown by acetaldehyde dehydrogenase, which may result in vomiting, nausea, and shortness of breath. In addition, the efficacy of doxycycline and erythromycin succinate may be reduced by alcohol consumption. Other effects of alcohol on antibiotic activity include altered activity of the liver enzymes that break down the antibiotic compound. In important infectious diseases, including tuberculosis, combination therapy (i.e., the concurrent application of two or more antibiotics) has been used to delay or prevent the emergence of resistance. In acute bacterial infections, antibiotics as part of combination therapy are prescribed for their synergistic effects to improve treatment outcome as the combined effect of both antibiotics is better than their individual effect. Methicillin-resistant Staphylococcus aureus infections may be treated with a combination therapy of fusidic acid and rifampin. Antibiotics used in combination may also be antagonistic and the combined effects of the two antibiotics may be less than if the individual antibiotic was given as part of a monotherapy. For example, Chloramphenicol and tetracyclines are antagonists to penicillins and aminoglycosides. However, this can vary depending on the species of bacteria. In general, combinations of a bacteriostatic antibiotic and bactericidal antibiotic are antagonistic. Antibiotics are commonly classified based on their mechanism of action, chemical structure, or spectrum of activity. Most target bacterial functions or growth processes. Those that target the bacterial cell wall (penicillins and cephalosporins) or the cell membrane (polymyxins), or interfere with essential bacterial enzymes (rifamycins, lipiarmycins, quinolones, and sulfonamides) have bactericidal activities. Those that target protein synthesis (macrolides, lincosamides and tetracyclines) are usually bacteriostatic (with the exception of bactericidal aminoglycosides). Further categorization is based on their target specificity. "Narrow-spectrum" antibiotics target specific types of bacteria, such as gram-negative or gram-positive, whereas broad-spectrum antibiotics affect a wide range of bacteria. Following a 40-year break in discovering new classes of antibacterial compounds, four new classes of antibiotics have been brought into clinical use in the late 2000s and early 2010s: cyclic lipopeptides (such as daptomycin), glycylcyclines (such as tigecycline), oxazolidinones (such as linezolid), and lipiarmycins (such as fidaxomicin). Antibacterial-resistant strains and species, sometimes referred to as "superbugs", now contribute to the emergence of diseases that were for a while well controlled. For example, emergent bacterial strains causing tuberculosis (TB) that are resistant to previously effective antibacterial treatments pose many therapeutic challenges. Every year, nearly half a million new cases of multidrug-resistant tuberculosis (MDR-TB) are estimated to occur worldwide. For example, NDM-1 is a newly identified enzyme conveying bacterial resistance to a broad range of beta-lactam antibacterials. The United Kingdom's Health Protection Agency has stated that "most isolates with NDM-1 enzyme are resistant to all standard intravenous antibiotics for treatment of severe infections." On May 26, 2016 an E coli bacteria "superbug" was identified in the United States resistant to colistin, "the last line of defence" antibiotic. Per the The ICU Book "The first rule of antibiotics is try not to use them, and the second rule is try not to use too many of them." Inappropriate antibiotic treatment and overuse of antibiotics have contributed to the emergence of antibiotic-resistant bacteria. Self prescription of antibiotics is an example of misuse. Many antibiotics are frequently prescribed to treat symptoms or diseases that do not respond to antibiotics or that are likely to resolve without treatment. Also, incorrect or suboptimal antibiotics are prescribed for certain bacterial infections. The overuse of antibiotics, like penicillin and erythromycin, has been associated with emerging antibiotic resistance since the 1950s. Widespread usage of antibiotics in hospitals has also been associated with increases in bacterial strains and species that no longer respond to treatment with the most common antibiotics. Before the early 20th century, treatments for infections were based primarily on medicinal folklore. Mixtures with antimicrobial properties that were used in treatments of infections were described over 2000 years ago. Many ancient cultures, including the ancient Egyptians and ancient Greeks, used specially selected mold and plant materials and extracts to treat infections. More recent observations made in the laboratory of antibiosis between microorganisms led to the discovery of natural antibacterials produced by microorganisms. Louis Pasteur observed, "if we could intervene in the antagonism observed between some bacteria, it would offer perhaps the greatest hopes for therapeutics". The term 'antibiosis', meaning "against life", was introduced by the French bacteriologist Jean Paul Vuillemin as a descriptive name of the phenomenon exhibited by these early antibacterial drugs. Antibiosis was first described in 1877 in bacteria when Louis Pasteur and Robert Koch observed that an airborne bacillus could inhibit the growth of Bacillus anthracis. These drugs were later renamed antibiotics by Selman Waksman, an American microbiologist, in 1942. Synthetic antibiotic chemotherapy as a science and development of antibacterials began in Germany with Paul Ehrlich in the late 1880s. Ehrlich noted certain dyes would color human, animal, or bacterial cells, whereas others did not. He then proposed the idea that it might be possible to create chemicals that would act as a selective drug that would bind to and kill bacteria without harming the human host. After screening hundreds of dyes against various organisms, in 1907, he discovered a medicinally useful drug, the first synthetic antibacterial salvarsan now called arsphenamine. In 1939, coinciding with the start of World War II, Rene Dubos reported the discovery of the first naturally derived antibiotic, tyrothricin, a compound of 20% gramicidin and 80% tyrocidine, from B. brevis. It was one of the first commercially manufactured antibiotics universally and was very effective in treating wounds and ulcers during World War II. Gramicidin, however, could not be used systemically because of toxicity. Tyrocidine also proved too toxic for systemic usage. Research results obtained during that period were not shared between the Axis and the Allied powers during World War II and limited access during the Cold War. Florey and Chain succeeded in purifying the first penicillin, penicillin G, in 1942, but it did not become widely available outside the Allied military before 1945. Later, Norman Heatley developed the back extraction technique for efficiently purifying penicillin in bulk. The chemical structure of penicillin was determined by Dorothy Crowfoot Hodgkin in 1945. Purified penicillin displayed potent antibacterial activity against a wide range of bacteria and had low toxicity in humans. Furthermore, its activity was not inhibited by biological constituents such as pus, unlike the synthetic sulfonamides. The discovery of such a powerful antibiotic was unprecedented, and the development of penicillin led to renewed interest in the search for antibiotic compounds with similar efficacy and safety. For their successful development of penicillin, which Fleming had accidentally discovered but could not develop himself, as a therapeutic drug, Ernst Chain and Howard Florey shared the 1945 Nobel Prize in Medicine with Fleming. Florey credited Dubos with pioneering the approach of deliberately and systematically searching for antibacterial compounds, which had led to the discovery of gramicidin and had revived Florey's research in penicillin. The term "antibiotic" derives from anti + βιωτικός (biōtikos), "fit for life, lively", which comes from βίωσις (biōsis), "way of life", and that from βίος (bios), "life". The term "antibacterial" derives from Greek ἀντί (anti), "against" + βακτήριον (baktērion), diminutive of βακτηρία (baktēria), "staff, cane", because the first ones to be discovered were rod-shaped. The increase in bacterial strains that are resistant to conventional antibacterial therapies has prompted the development of bacterial disease treatment strategies that are alternatives to conventional antibacterials, including phage therapy. Phage therapy is another method for treating antibiotic-resistant strains of bacteria. Phage therapy infects pathogenic bacteria with their own viruses, bacteriophages. Bacteriophages, also known simply as phages, infect and can kill bacteria. Phages insert their DNA into the bacterium, where it is transcribed and used to make new phages, after which the cell will lyse, releasing new phage able to infect and destroy further bacteria of the same strain. The high specificity of phage protects "good" bacteria from destruction. When applicable, bacteriophage therapy defeats antibiotic resistant bacteria. Some antioxidant dietary supplements contain polyphenols, such as grape seed extract, and demonstrate in vitro anti-bacterial properties. Streptomyces research is expected to provide new antibiotics, including treatment against MRSA and infections resistant to commonly used medication. Efforts of John Innes Centre and universities in the UK, supported by BBSRC, resulted in the creation of spin-out companies, for example Novacta Biosystems, which has designed the type-b lantibiotic-based compound NVB302 (in phase 1) to treat Clostridium difficile infections. Possible improvements include clarification of clinical trial regulations by FDA. Furthermore, appropriate economic incentives could persuade pharmaceutical companies to invest in this endeavor. In the US, the Antibiotic Development to Advance Patient Treatment (ADAPT) Act was introduced with the aim of fast tracking the drug development of antibiotics to combat the growing threat of 'superbugs'. Under this Act, FDA can approve antibiotics and antifungals treating life-threatening infections based on smaller clinical trials. The CDC will monitor the use of antibiotics and the emerging resistance, and publish the data. The FDA antibiotics labeling process, 'Susceptibility Test Interpretive Criteria for Microbial Organisms' or 'breakpoints', will provide accurate data to healthcare professionals. According to Allan Coukell, senior director for health programs at The Pew Charitable Trusts, "By allowing drug developers to rely on smaller datasets, and clarifying FDA's authority to tolerate a higher level of uncertainty for these drugs when making a risk/benefit calculation, ADAPT would make the clinical trials more feasible." 1 2 3 "Antibiotics". NHS. 5 June 2014. Retrieved 17 January 2015. ↑ For example, metronidazole: "Metronidazole". The American Society of Health-System Pharmacists. Retrieved July 31, 2015. 1 2 Chemical Analysis of Antibiotic Residues in Food. (PDF). John Wiley & Sons, Inc. 2012. pp. 1–60. ISBN 9781449614591. ↑ Tan, Siang Yong; Tatsumura, Yvonne (2015-07-01). 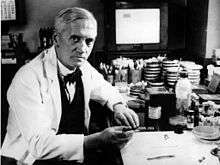 "Alexander Fleming (1881–1955): Discoverer of penicillin". Singapore Medical Journal. 56 (7): 366–367. doi:10.11622/smedj.2015105. ISSN 0037-5675. PMC 4520913 . PMID 26243971. ↑ "Antibiotics being incorrectly prescribed in Australian nursing homes, prompting superbug fears". ABC Australia. 10 June 2016. Retrieved 12 June 2016. ↑ "UK study warns of threat of antibiotics overuse, lack of new drugs". CCTV America. 19 May 2016. Retrieved 12 June 2016. ↑ "Superbugs could kill more people than cancer, report warns". CBS News. 19 May 2016. Retrieved 12 June 2016. ↑ "Antimicrobial resistance: global report on surveillance" (PDF). The World Health Organization. April 2014. ISBN 978 92 4 156474 8. Retrieved 13 June 2016. ↑ Williams KJ (2009). "The introduction of 'chemotherapy' using arsphenamine - the first magic bullet". J R Soc Med. 102 (8): 343–8. doi:10.1258/jrsm.2009.09k036. PMC 2726818 . PMID 19679737. 1 2 Goodman, Louis S.; Gilman, Alfred (1941). The Pharmacological Basis of Therapeutics. New York: Macmillan. ↑ Aminov RI (2010). "A brief history of the antibiotic era: lessons learned and challenges for the future". Frontiers in Microbiology. 1: 134. doi:10.3389/fmicb.2010.00134. PMC 3109405 . PMID 21687759. ↑ "Physiology or Medicine 1939 – Presentation Speech". Nobel Foundation. Retrieved 14 January 2015. ↑ Gualerzi, Claudio O.; Brandi, Letizia; Fabbretti, Attilio; Pon, Cynthia L. (2013-12-04). Antibiotics: Targets, Mechanisms and Resistance. John Wiley & Sons. p. 1. ISBN 9783527333059. ↑ "American Heritage Dictionary of the English Language" (5th ed.). 2011. A substance, such as penicillin or erythromycin, produced by or derived from certain microorganisms, including fungi and bacteria, that can destroy or inhibit the growth of other microorganisms, especially bacteria. Antibiotics are widely used in the prevention and treatment of infectious diseases. ↑ Brooks, Megan (November 16, 2015). "Public Confused About Antibiotic Resistance, WHO Says". Medscape Multispeciality. Retrieved 21 November 2015. ↑ "General Background: Antibiotic Agents". Alliance for the Prudent Use of Antibiotics. Retrieved 21 December 2014. 1 2 3 Antibiotics Simplified. Jones & Bartlett Publishers. 2011. pp. 15–17. ISBN 9781449614591. 1 2 3 4 Leekha, Surbhi; Terrell, Christine L.; Edson, Randall S. (2011-02-01). "General principles of antimicrobial therapy". Mayo Clinic Proceedings. 86 (2): 156–167. doi:10.4065/mcp.2010.0639. ISSN 1942-5546. PMC 3031442 . PMID 21282489. ↑ Rollins, KE; Varadhan, KK; Neal, KR; Lobo, DN (19 May 2016). "Antibiotics Versus Appendicectomy for the Treatment of Uncomplicated Acute Appendicitis: An Updated Meta-Analysis of Randomised Controlled Trials.". World journal of surgery. doi:10.1007/s00268-016-3561-7. PMID 27199000. ↑ Flowers, Christopher R.; Seidenfeld, Jerome; Bow, Eric J.; Karten, Clare; Gleason, Charise; Hawley, Douglas K.; Kuderer, Nicole M.; Langston, Amelia A.; Marr, Kieren A. (2013-02-20). "Antimicrobial prophylaxis and outpatient management of fever and neutropenia in adults treated for malignancy: American Society of Clinical Oncology clinical practice guideline". Journal of Clinical Oncology: Official Journal of the American Society of Clinical Oncology. 31 (6): 794–810. doi:10.1200/JCO.2012.45.8661. ISSN 1527-7755. PMID 23319691. ↑ Bow, Eric J. (2013-07-01). "Infection in neutropenic patients with cancer". Critical Care Clinics. 29 (3): 411–441. doi:10.1016/j.ccc.2013.03.002. ISSN 1557-8232. PMID 23830647. ↑ Pangilinan, Ronald; Tice, Alan; Tillotson, Glenn (2009-10-01). "Topical antibiotic treatment for uncomplicated skin and skin structure infections: review of the literature". Expert Review of Anti-Infective Therapy. 7 (8): 957–965. doi:10.1586/eri.09.74. ISSN 1744-8336. PMID 19803705. 1 2 Lipsky, Benjamin A.; Hoey, Christopher (2009-11-15). "Topical antimicrobial therapy for treating chronic wounds". Clinical Infectious Diseases. 49 (10): 1541–1549. doi:10.1086/644732. ISSN 1537-6591. PMID 19842981. ↑ Heal, Clare F; Banks, Jennifer L; Lepper, Phoebe D; Kontopantelis, Evangelos; van Driel, Mieke L. "Topical antibiotics for preventing surgical site infection in wounds healing by primary intention". Cochrane Database of Systematic Reviews 2016 (11). doi:10.1002/14651858.CD011426.pub2. 1 2 3 Slama TG, Amin A, Brunton SA, et al. (July 2005). "A clinician's guide to the appropriate and accurate use of antibiotics: the Council for Appropriate and Rational Antibiotic Therapy (CARAT) criteria". Am. J. Med. 118 Suppl 7A (7): 1S–6S. doi:10.1016/j.amjmed.2005.05.007. PMID 15993671. ↑ "Antibiotics and Selective Toxicity - Boundless Open Textbook". Boundless. Retrieved 2016-02-12. ↑ "Antibiotics - Side effects". NHS Choices. National Health Service (NHS), UK. 6 May 2014. Retrieved 6 February 2016. ↑ "Antibiotic-Associated Diarrhea - All you should know". Retrieved 2014-12-28. ↑ Pirotta MV, Garland SM (2006). "Genital Candida species detected in samples from women in Melbourne, Australia, before and after treatment with antibiotics". J Clin Microbiol. 44 (9): 3213–3217. doi:10.1128/JCM.00218-06. PMC 1594690 . PMID 16954250. ↑ Lewis, Trevor; Cook, Jill (1 January 2014). "Fluoroquinolones and Tendinopathy: A Guide for Athletes and Sports Clinicians and a Systematic Review of the Literature". Journal of Athletic Training. 49 (3): 422–427. doi:10.4085/1062-6050-49.2.09. ISSN 1062-6050. PMC 4080593 . ↑ Ray, Katrina (September 2012). "Adding weight to the microbiota's role in obesity—exposure to antibiotics early in life can lead to increased adiposity". Nature Reviews Endocrinology. 8: 623. doi:10.1038/nrendo.2012.173. 1 2 Jess, Tine (December 2014). "Microbiota, Antibiotics, and Obesity". The New England Journal of Medicine. 371: 2526–2528. doi:10.1056/NEJMcibr1409799. ↑ Cho, Ilseung; et al. (August 2012). "Antibiotics in early life alter the murine colonic microbiome and adiposity". Nature. 488: 621–6. doi:10.1038/nature11400. PMC 3553221 . PMID 22914093. 1 2 Cox, Laura; et al. (14 August 2014). "Altering the intestinal microbiota during a critical developmental window has lasting metabolic consequences". Cell. 158 (4): 705–21. doi:10.1016/j.cell.2014.05.052. PMC 4134513 . PMID 25126780. ↑ Trasande, L.; Blustein, J.; Liu, M.; Corwin, E.; Cox, L. M.; Blaser, M. J. (2013-01-01). "Infant antibiotic exposures and early-life body mass". International Journal of Obesity. 37 (1): 16–23. doi:10.1038/ijo.2012.132. ISSN 0307-0565. PMC 3798029 . PMID 22907693. ↑ Thorpe, Karen; Staton, Sally; Sawyer, Emily; Pattinson, Cassandra; Haden, Catherine; Smith, Simon (1 July 2015). "Napping, development and health from 0 to 5 years: a systematic review". Archives of Disease in Childhood. 100 (7): 615–622. doi:10.1136/archdischild-2014-307241. PMID 25691291. 1 2 3 Weaver K, Glasier A (February 1999). "Interaction between broad-spectrum antibiotics and the combined oral contraceptive pill. A literature review". Contraception. 59 (2): 71–8. doi:10.1016/S0010-7824(99)00009-8. PMID 10361620. ↑ Weisberg E (May 1999). "Interactions between oral contraceptives and antifungals/antibacterials. Is contraceptive failure the result?". Clin Pharmacokinet. 36 (5): 309–13. doi:10.2165/00003088-199936050-00001. PMID 10384856. ↑ Hassan T (March 1987). "Pharmacologic considerations for patients taking oral contraceptives". Conn Dent Stud J. 7: 7–8. PMID 3155374. ↑ Orme ML, Back DJ (December 1990). "Factors affecting the enterohepatic circulation of oral contraceptive steroids". Am. J. Obstet. Gynecol. 163 (6 Pt 2): 2146–52. doi:10.1016/0002-9378(90)90555-L. PMID 2256523. Archived from the original on 17 November 2010. ↑ Lwanga, J; Mears, A; Bingham, J S; Bradbeer, C S (2008). "Do antibiotics and alcohol mix? The beliefs of genitourinary clinic attendees". BMJ. 337: a2885. doi:10.1136/bmj.a2885. 1 2 "Can I drink alcohol while taking antibiotics?". NHS Direct (UK electronic health service). Archived from the original on 17 November 2010. Retrieved 17 February 2008. ↑ Moore, Alison A.; Whiteman, Elizabeth J.; Ward, Katherine T. (1 March 2007). "Risks of Combined Alcohol-Medication Use in Older Adults". The American journal of geriatric pharmacotherapy. 5 (1): 64–74. ISSN 1543-5946. PMC 4063202 . ↑ Stockley, IH (2002). Stockley's Drug Interactions (6th ed.). London: Pharmaceutical Press. 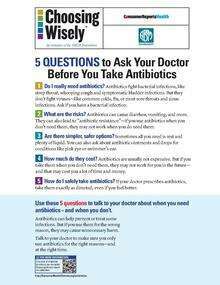 1 2 "Antibiotics FAQ". McGill University, Canada. Archived from the original on 16 February 2008. Retrieved 17 February 2008. 1 2 3 Pankey GA, Sabath LD (March 2004). "Clinical relevance of bacteriostatic versus bactericidal mechanisms of action in the treatment of Gram-positive bacterial infections". Clin Infect Dis. 38 (6): 864–870. doi:10.1086/381972. PMID 14999632. ↑ Mascio CT, Alder JD, Silverman JA (December 2007). "Bactericidal action of daptomycin against stationary-phase and nondividing Staphylococcus aureus cells". Antimicrob. Agents Chemother. 51 (12): 4255–60. doi:10.1128/AAC.00824-07. PMC 2167999 . PMID 17923487. ↑ Pelczar MJ, Chan EC, Krieg NR (2010). "Host-Parasite Interaction; Nonspecific Host Resistance". Microbiology Concepts and Applications (6th ed.). New York: McGraw-Hill. pp. 478–479. ↑ Rhee KY, Gardiner DF (September 2004). "Clinical relevance of bacteriostatic versus bactericidal activity in the treatment of gram-positive bacterial infections". Clin. Infect. Dis. 39 (5): 755–6. doi:10.1086/422881. PMID 15356797. ↑ Wiegand I, Hilpert K, Hancock RE (January 2008). "Agar and broth dilution methods to determine the minimal inhibitory concentration (MIC)of antimicrobial substances". Nature Protocols. 3 (2): 163–175. doi:10.1038/nprot.2007.521. PMID 18274517. ↑ Dalhoff A, Ambrose PG, Mouton JW (August 2009). "A long journey from minimum inhibitory concentration testing to clinically predictive breakpoints: deterministic and probabilistic approaches in deriving breakpoints". Infection. 37 (4): 296–305. doi:10.1007/s15010-009-7108-9. PMID 19629383. 1 2 3 4 Ocampo, Paolo S.; Lázár, Viktória; Papp, Balázs; Arnoldini, Markus; Abel zur Wiesch, Pia; Busa-Fekete, Róbert; Fekete, Gergely; Pál, Csaba; Ackermann, Martin (2014-08-01). "Antagonism between bacteriostatic and bactericidal antibiotics is prevalent". Antimicrobial Agents and Chemotherapy. 58 (8): 4573–4582. doi:10.1128/AAC.02463-14. ISSN 1098-6596. PMC 4135978 . PMID 24867991. 1 2 Bollenbach, Tobias (2015-10-01). "Antimicrobial interactions: mechanisms and implications for drug discovery and resistance evolution". Current Opinion in Microbiology. 27: 1–9. doi:10.1016/j.mib.2015.05.008. ISSN 1879-0364. PMID 26042389. ↑ "antagonism". Retrieved August 25, 2014. ↑ Finberg RW, Moellering RC, Tally FP, et al. (November 2004). "The importance of bactericidal drugs: future directions in infectious disease". Clin. Infect. Dis. 39 (9): 1314–20. doi:10.1086/425009. PMID 15494908. ↑ Srivastava A, Talaue M, Liu S, Degen D, Ebright RY, Sineva E, Chakraborty A, Druzhinin SY, Chatterjee S, Mukhopadhyay J, Ebright YW, Zozula A, Shen J, Sengupta S, Niedfeldt RR, Xin C, Kaneko T, Irschik H, Jansen R, Donadio S, Connell N, Ebright RH (2011). "New target for inhibition of bacterial RNA polymerase: 'switch region'". Curr. Opin. Microbiol. 14 (5): 532–43. doi:10.1016/j.mib.2011.07.030. PMC 3196380 . PMID 21862392. 1 2 von Nussbaum, Franz; Brands, Michael; Hinzen, Berthold; Weigand, Stefan; Häbich, Dieter (4 August 2006). "Antibacterial Natural Products in Medicinal Chemistry—Exodus or Revival?". Angewandte Chemie International Edition. 45 (31): 5072–5129. doi:10.1002/anie.200600350. ISSN 1521-3773. Retrieved 3 August 2016. ↑ Dougherty TJ; Pucci MJ (18 December 2011). Antibiotic Discovery and Development. Springer. p. 800. ↑ William Andrew Publishing (2013). Pharmaceutical Manufacturing Encyclopedia. Elsevier Science. p. 305. ↑ Levy SB (October 1994). "Balancing the drug-resistance equation". Trends Microbiol. 2 (10): 341–2. doi:10.1016/0966-842X(94)90607-6. PMID 7850197. ↑ Luria SE, Delbrück M (November 1943). "Mutations of Bacteria from Virus Sensitivity to Virus Resistance". Genetics. 28 (6): 491–511. PMC 1209226 . PMID 17247100. Archived from the original on 17 November 2010. 1 2 Pearson, Carol (28 February 2007). "Antibiotic Resistance Fast-Growing Problem Worldwide". Voice Of America. Archived from the original on 2 December 2008. Retrieved 29 December 2008. ↑ Topp E, Chapman R, Devers-Lamrani M, Hartmann A, Marti R, Martin-Laurent F, Sabourin L, Scott A, Sumarah M (2013). "Accelerated Biodegradation of Veterinary Antibiotics in Agricultural Soil following Long-Term Exposure, and Isolation of a Sulfamethazine-degrading sp". J. Environ. Qual. 42 (1): 173–8. doi:10.2134/jeq2012.0162. PMID 23673752. 1 2 3 Witte W (September 2004). "International dissemination of antibiotic resistant strains of bacterial pathogens". Infect. Genet. Evol. 4 (3): 187–91. doi:10.1016/j.meegid.2003.12.005. PMID 15450197. ↑ Andersson DI (October 2006). "The biological cost of mutational antibiotic resistance: any practical conclusions?". Current Opinion in Microbiology. 9 (5): 461–5. doi:10.1016/j.mib.2006.07.002. PMID 16890008. ↑ D'Costa VM, King CE, Kalan L, Morar M, Sung WW, Schwarz C, Froese D, Zazula G, Calmels F, Debruyne R, Golding GB, Poinar HN, Wright GD (August 2011). "Antibiotic resistance is ancient". Nature. 477 (7365): 457–61. doi:10.1038/nature10388. PMID 21881561. ↑ Gladki A, Kaczanowski S, Szczesny P, Zielenkiewicz P (February 2013). "The evolutionary rate of antibacterial drug targets". BMC Bioinformatics. 14 (1): 36. doi:10.1186/1471-2105-14-36. PMC 3598507 . PMID 23374913. 1 2 Alekshun MN, Levy SB (March 2007). "Molecular mechanisms of antibacterial multidrug resistance". Cell. 128 (6): 1037–50. doi:10.1016/j.cell.2007.03.004. PMID 17382878. ↑ Marshall CG, Lessard IA, Park I, Wright GD (September 1998). "Glycopeptide antibiotic resistance genes in glycopeptide-producing organisms". Antimicrob. Agents Chemother. 42 (9): 2215–20. PMC 105782 . PMID 9736537. Archived from the original on 17 November 2010. ↑ Nikaido H (February 2009). 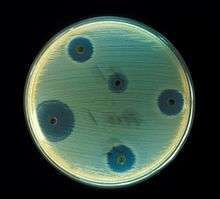 "Multidrug Resistance in Bacteria". Annu. Rev. Biochem. 78 (1): 119–46. doi:10.1146/annurev.biochem.78.082907.145923. PMC 2839888 . PMID 19231985. 1 2 3 Baker-Austin C, Wright MS, Stepanauskas R, McArthur JV (April 2006). "Co-selection of antibiotic and metal resistance". Trends Microbiol. 14 (4): 176–82. doi:10.1016/j.tim.2006.02.006. PMID 16537105. ↑ Boseley, Sarah (12 August 2010). "Are you ready for a world without antibiotics?". The Guardian. London. Archived from the original on 17 November 2010. ↑ "Health Protection Report". Health Protection Agency. 3 July 2009. Archived from the original on 17 November 2010. ↑ McGann, Patrick; Snesrud, Erik; Maybank, Rosslyn; Corey, Brendan; Ong, Ana C.; Clifford, Robert; Hinkle, Mary; Whitman, Timothy; Lesho, Emil (2016-05-26). "Escherichia coli Harboring mcr-1 and blaCTX-M on a Novel IncF Plasmid: First report of mcr-1 in the USA". Antimicrobial Agents and Chemotherapy. 60: AAC.01103–16. doi:10.1128/AAC.01103-16. ISSN 0066-4804. PMC 4914657 . PMID 27230792. ↑ Moyer, Melinda Wenner. "Dangerous New Antibiotic-Resistant Bacteria Reach U.S.". Scientific American. Retrieved 2016-05-27. ↑ Marino PL (2007). "Antimicrobial therapy". The ICU book. Hagerstown, MD: Lippincott Williams & Wilkins. p. 817. ISBN 978-0-7817-4802-5. 1 2 3 Larson E (2007). "Community factors in the development of antibiotic resistance". Annu Rev Public Health. 28 (1): 435–447. doi:10.1146/annurev.publhealth.28.021406.144020. PMID 17094768. 1 2 Hawkey PM (September 2008). "The growing burden of antimicrobial resistance". J. Antimicrob. Chemother. 62 Suppl 1 (Supplement 1): i1–9. doi:10.1093/jac/dkn241. PMID 18684701. ↑ Ong S, Nakase J, Moran GJ, Karras DJ, Kuehnert MJ, Talan DA (2007). "Antibiotic use for emergency department patients with upper respiratory infections: prescribing practices, patient expectations, and patient satisfaction". Annals of Emergency Medicine. 50 (3): 213–20. doi:10.1016/j.annemergmed.2007.03.026. PMID 17467120. ↑ Metlay JP, Camargo CA, MacKenzie T, et al. (2007). "Cluster-randomized trial to improve antibiotic use for adults with acute respiratory infections treated in emergency departments". Annals of Emergency Medicine. 50 (3): 221–30. doi:10.1016/j.annemergmed.2007.03.022. PMID 17509729. ↑ Coxeter, Peter (11 November 2015). "Interventions to facilitate shared decision making to address antibiotic use for acute respiratory infections in primary care". Cochrane Database of Systematic Reviews. 11:010907: CD010907. doi:10.1002/14651858.CD010907.pub2. PMID 26560888. 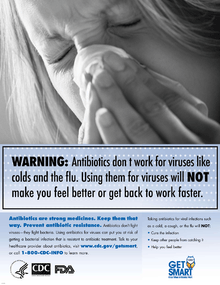 ↑ "Keep Antibiotics Working". Keep Antibiotics Working. Archived from the original on 17 November 2010. Retrieved 21 May 2010. ↑ Sabuncu E, David J, Bernède-Bauduin C, Pépin S, Leroy M, Boëlle PY, Watier L, Guillemot D (2009). Klugman KP, ed. "Significant reduction of antibiotic use in the community after a nationwide campaign in France, 2002–2007". PLoS Med. 6 (6): e1000084. doi:10.1371/journal.pmed.1000084. PMC 2683932 . PMID 19492093. Archived from the original on 17 November 2010. ↑ "Regulation (EC) No 1831/2003 of the European Parliament and of the Council". ↑ "The Overuse of Antibiotics in Food Animals Threatens Public Health". Consumer Reports. Retrieved 4 July 2016. ↑ "Kee Antibiotics Working" (PDF). Archived from the original (PDF) on 25 March 2009. Retrieved 12 November 2008. ↑ John Gever (23 March 2012). "FDA Told to Move on Antibiotic Use in Livestock". MedPage Today. Retrieved 24 March 2012. ↑ Lindblad WJ (2008). "Considerations for Determining if a Natural Product Is an Effective Wound-Healing Agent". International Journal of Lower Extremity Wounds. 7 (2): 75–81. doi:10.1177/1534734608316028. PMID 18483011. ↑ Forrest RD (March 1982). "Early history of wound treatment". J R Soc Med. 75 (3): 198–205. PMC 1437561 . PMID 7040656. ↑ Wainwright, Milton (1989). "Moulds in ancient and more recent medicine". Mycologist. 3 (1): 21–23. doi:10.1016/S0269-915X(89)80010-2. ↑ Kingston W (June 2008). "Irish contributions to the origins of antibiotics". Irish Journal of Medical Science. 177 (2): 87–92. doi:10.1007/s11845-008-0139-x. PMID 18347757. ↑ Foster W, Raoult A (December 1974). "Early descriptions of antibiosis". J R Coll Gen Pract. 24 (149): 889–94. PMC 2157443 . PMID 4618289. ↑ Landsberg, H (1949). "Prelude to the discovery of penicillin". Isis. 40 (3): 225–7. doi:10.1086/349043. 1 2 SA Waksman (1947). "What Is an Antibiotic or an Antibiotic Substance?". Mycologia. 39 (5): 565–569. doi:10.2307/3755196. JSTOR 3755196. PMID 20264541. ↑ Limbird LE (December 2004). "The receptor concept: a continuing evolution". Mol. Interv. 4 (6): 326–36. doi:10.1124/mi.4.6.6. PMID 15616162. 1 2 Bosch F, Rosich L (2008). "The contributions of Paul Ehrlich to pharmacology: a tribute on the occasion of the centenary of his Nobel Prize". Pharmacology. 82 (3): 171–9. doi:10.1159/000149583. PMC 2790789 . PMID 18679046. ↑ Fleming A (1980). "Classics in infectious diseases: on the antibacterial action of cultures of a penicillium, with special reference to their use in the isolation of B. influenzae by Alexander Fleming, Reprinted from the British Journal of Experimental Pathology 10:226–236, 1929". Rev. Infect. Dis. 2 (1): 129–39. doi:10.1093/clinids/2.1.129. PMID 6994200. ↑ Sykes R (2001). "Penicillin: from discovery to product". Bull. World Health Organ. 79 (8): 778–9. PMC 2566502 . PMID 11545336. ↑ Wright, Peter M.; Seiple, Ian B.; Myers, Andrew G. (2014-08-18). "The evolving role of chemical synthesis in antibacterial drug discovery". Angewandte Chemie (International Ed. in English). 53 (34): 8840–8869. doi:10.1002/anie.201310843. ISSN 1521-3773. PMC 4536949 . PMID 24990531. ↑ Aminov, Rustam I. (2010-01-01). "A brief history of the antibiotic era: lessons learned and challenges for the future". Frontiers in Microbiology. 1: 134. doi:10.3389/fmicb.2010.00134. ISSN 1664-302X. PMC 3109405 . PMID 21687759. 1 2 Van Epps HL (2006). "René Dubos: unearthing antibiotics". J. Exp. Med. 203 (2): 259. doi:10.1084/jem.2032fta. PMC 2118194 . PMID 16528813. ↑ Capocci, Mauro (2014-01-01). "Cold drugs. Circulation, production and intelligence of antibiotics in post-WWII years". Medicina Nei Secoli. 26 (2): 401–421. ISSN 0394-9001. PMID 26054208. ↑ HW Florey (1945). "Use of Micro-organisms for therapeutic purposes". Br Med J. 2 (4427): 635–642. doi:10.1136/bmj.2.4427.635. PMC 2060276 . PMID 20786386. ↑ Scholar E. M., Pratt W. B. (2000). The Antimicrobial Drugs. Oxford University Press, USA. p. 3. ISBN 978-0195125290. ↑ Davies, Julian; Davies, Dorothy (2010-09-01). "Origins and evolution of antibiotic resistance". Microbiology and molecular biology reviews: MMBR. 74 (3): 417–433. doi:10.1128/MMBR.00016-10. ISSN 1098-5557. PMC 2937522 . PMID 20805405. ↑ Liddell, Henry George; Scott, Robert (eds.). "βιωτικός". A Greek-English Lexicon – via Perseus Project. ↑ Liddell, Henry George; Scott, Robert (eds.). "βίωσις". A Greek-English Lexicon – via Perseus Project. ↑ Liddell, Henry George; Scott, Robert (eds.). "βίος". A Greek-English Lexicon – via Perseus Project. ↑ Liddell, Henry George; Scott, Robert (eds.). "ἀντί". A Greek-English Lexicon – via Perseus Project. ↑ Liddell, Henry George; Scott, Robert (eds.). "βακτηρία". A Greek-English Lexicon – via Perseus Project. ↑ Abedon, Stephen T; Kuhl, Sarah J; Blasdel, Bob G; Kutter, Elizabeth Martin (2011-01-01). "Phage treatment of human infections". Bacteriophage. 1 (2): 66–85. doi:10.4161/bact.1.2.15845. ISSN 2159-7073. PMC 3278644 . PMID 22334863. 1 2 Abreu, Ana Cristina; McBain, Andrew J.; Simões, Manuel (2012-08-07). "Plants as sources of new antimicrobials and resistance-modifying agents". Natural Product Reports. 29 (9). doi:10.1039/c2np20035j. ISSN 1460-4752. 1 2 Marquez B (2005). "Bacterial efflux systems and efflux pumps inhibitors". Biochimie. 87 (12): 1137–47. doi:10.1016/j.biochi.2005.04.012. PMID 15951096. ↑ Drawz, Sarah M.; Bonomo, Robert A. (2010-01-01). "Three Decades of β-Lactamase Inhibitors". Clinical Microbiology Reviews. 23 (1): 160–201. doi:10.1128/CMR.00037-09. ISSN 0893-8512. PMC 2806661 . PMID 20065329. ↑ Allison KR, Brynildsen MP, Collins JJ (2011). "Metabolite-enabled eradication of bacterial persisters by aminoglycosides". Nature. 473 (7346): 216–20. doi:10.1038/nature10069. PMC 3145328 . PMID 21562562. ↑ Alita A. Miller; Paul F. Miller (2011). "Current Strategies for Antibacterial Vaccine development". Emerging Trends in Antibacterial Discovery: Answering the Call to Arms. Horizon Scientific Press. p. 283. ↑ Miller, AA (2011). Miller, PF, ed. Emerging Trends in Antibacterial Discovery: Answering the Call to Arms. Caister Academic Press. ISBN 978-1-904455-89-9. 1 2 3 Sulakvelidze, A.; Alavidze, Z.; Morris, Jr J. G. (2001). "Bacteriophage Therapy". Antimicrob Agents Chemother. 45 (3): 649–659. doi:10.1128/aac.45.3.649-659.2001. ↑ Al-Habib A; Al-Saleh, E (2010). "Bactericidal effect of grape seed extract on methicillin-resistant Staphylococcus aureus (MRSA)". Journal of Toxicology Science. 357 (3): 357–64. PMID 20519844. ↑ Smullen, J.; Koutsou, G.A. ; Foster, H.A. ; Zumbé, A.; Storey, D.M. (2007). "The Antibacterial Activity of Plant Extracts Containing Polyphenols against Streptococcus mutans". Caries Research. 41 (5): 342–9. doi:10.1159/000104791. PMID 17713333. ↑ Cushnie TP, Lamb AJ (Aug 2011). "Recent advances in understanding the antibacterial properties of flavonoids.". Int J Antimicrob Agents. 38 (2): 99–107. doi:10.1016/j.ijantimicag.2011.02.014. PMID 21514796. ↑ Steenhuysen, Julie (18 April 2013). "Drug pipeline for worst superbugs 'on life support': report". Reuters. Retrieved 23 June 2013. 1 2 Boucher HW, Talbot GH, Benjamin DK, Bradley J, Guidos RJ, Jones RN, Murray BE, Bonomo RA, Gilbert D (2013). Infectious Diseases Society of America. "10 x '20 Progress--development of new drugs active against gram-negative bacilli: an update from the Infectious Diseases Society of America". Clin. Infect. Dis. 56 (12): 1685–94. doi:10.1093/cid/cit152. PMC 3707426 . PMID 23599308. ↑ Osbourn, Anne; Goss, Rebecca J.; Carter, Guy T. (28 Mar 2014). "Discovery and Development of NVB302, a Semisynthetic Antibiotic for Treatment of Clostridium difficile Infection". Natural Products: Discourse, Diversity, and Design. John Wiley & Sons, Inc.: 455–468. doi:10.1002/9781118794623.ch24. Retrieved 19 January 2015. ↑ Press Release (12 December 2013). "Green, Gingrey Introduce ADAPT Act to Safeguard Public Health". US Congress. ↑ "Antibiotic Development to Advance Patient Treatment Act of 2013" (PDF). US Congress. 12 December 2013. ↑ Clarke, Toni. "U.S. Congress urged to pass bill to speed development of antibiotics". Reuters. Retrieved 19 September 2014. Davies, Julian; Davies, Dorothy (1 September 2010). "Origins and Evolution of Antibiotic Resistance". Microbiology and Molecular Biology Reviews : MMBR. 74 (3): 417–433. doi:10.1128/MMBR.00016-10. ISSN 1092-2172. PMC 2937522 . PMID 20805405. "Antibiotics: MedlinePlus". NIH.gov. National Institute of Health. Retrieved 19 July 2016. "Short-course versus long-course antibiotic treatment for hospital-acquired pneumonia in adult intensive care patients | Cochrane". Reviews. doi:10.1002/14651858.CD007577.pub3. Giedraitienė, Agnė; Vitkauskienė, Astra; Naginienė, Rima; Pavilonis, Alvydas (1 January 2011). "Antibiotic resistance mechanisms of clinically important bacteria". Medicina (Kaunas, Lithuania). 47 (3): 137–146. ISSN 1648-9144. Retrieved 9 August 2016.